Rohingya refugees inside a Bangladeshi refugee camp held a silent protest on Tuesday, urging visiting United Nations officials to help members of their community detained indefinitely in Saudi Arabia. 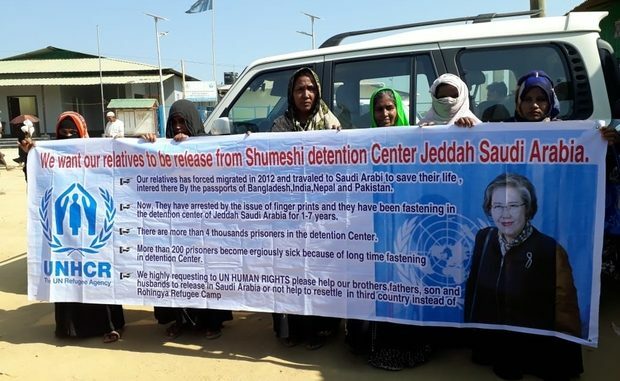 Footage sent to Middle East Eye by detainees showed Rohingya women holding a banner asking the UN refugee agency (UNHCR) and Special Rapporteur on Myanmar Yanghee Lee to help their “brothers, fathers, sons and husbands” detained in Saudi Arabia. 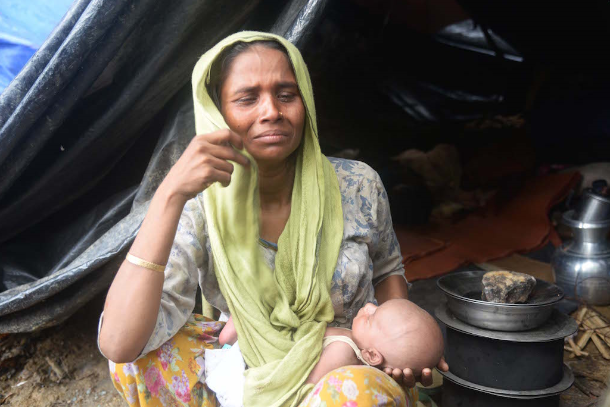 Lee can be seen walking past the women as she visited Rohingya in southern Bangladesh’s Kutupalong camp who have been forcibly displaced from their homes in neighbouring Myanmar. The special rapporteur had not responded to request for comment by the time of publication. Heartbreaking. Video showing Rohingya refugees in Bangladesh urging @YangheeLeeSKKU to intervene to help their relatives who’ve been detained indefinitely in Saudi Arabia. Yanghee Lee has not made a single statement on Rohingya in Saudi despite repeated requests. Relatives of Rohingya detainees held in Saudi Arabia have held regular protests in the camp demanding their loved ones’ release, which has not gone unnoticed by those stuck in legal limbo in the kingdom. Habib, a Rohingya detainee in Shumaisi detention centre, told Middle East Eye he was “elated to see” refugees speaking up for them. “It makes me happy seeing my sisters and brothers speaking up for all of us inside Shumaisi,” said Habib, who like all those spoken to in detention has had his name changed for security reasons. 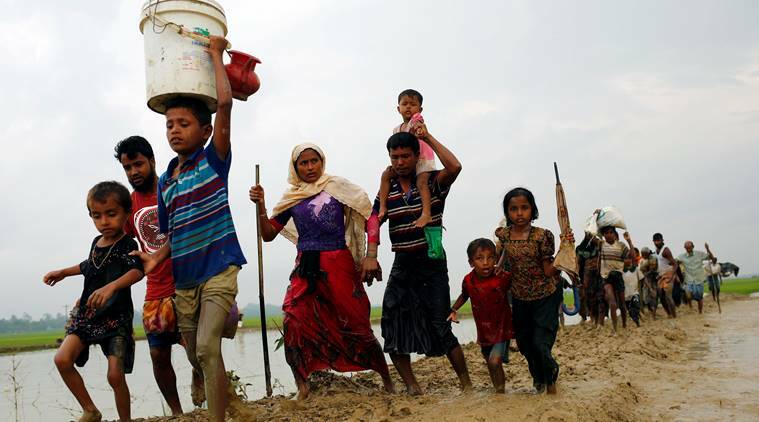 John Quinley, a human rights specialist who works for advocacy group Fortify Rights, called on Saudi Arabia to release the Rohingya held in Shumaisi. “Rohingya diaspora have been at the forefront of spotlighting the human rights violations happening in places like Saudi Arabia,” Quinley told MEE. “Saudi Arabia should immediately release all Rohingya refugees arbitrarily and indefinitely detained in the country. The silent protest comes as activists told MEE that at least 250 Rohingya detainees were being prepared for deportation to Bangladesh on Sunday, despite coming to the kingdom from Myanmar. Zahid, another detainee inside the Shumaisi detention centre, said that the Saudis were deporting more than 200 refugees in groups of ten. “They prepared the Rohingya detainees for Bangladesh and took them to the Hajj terminal in Jeddah for deportation,” he said. Deportations to Bangladesh, where as many as 700,000 Rohingya have fled to in the face of massacres that have been described by some rights groups as a genocide, have prompted some detainees to go on hunger strike to stop the Saudis from expelling them. Photos and videos smuggled out of Shumaisi in recent days have shown detainees refusing to take their daily food rations, leaving them on the floor for the Saudi immigration officers to collect. In November, Middle East Eye reported that Rohingya detainees were being prepared for deportation just days after Bangladeshi Prime Minister Sheikh Hasina visited Saudi Arabia and met Saudi Crown Prince Mohammed bin Salman. Detainees told MEE they were punched in the chest by Saudi immigration officers and forced to sign documents testifying to their “full mental health” on Saudi interior ministry forms before their deportation to Bangladesh. Scores of Rohingya had resorted to obtaining passports from people smugglers, often via forged documents, following Myanmar’s ban on members of their community obtaining Burmese passports. Upon arrival, the refugees are told to give their fingerprint, which is registered to the passport they came to the country on. This has meant scores of Rohingya had been registered on passports obtained via fake documents. Bangladesh has jailed more than a dozen Rohingya deported from Saudi Arabia for using fake documents to get to the kingdom – a move rights group Amnesty International has condemned.